The planning stage of any exhibition is the key to success. If you plan in detail before your exhibition, you are almost certainly guaranteed success. You have designed your exhibition stand, selected key members of staff to occupy your stand and you have briefed your team on your business objectives. Now, a plan of action is required for attracting visitors to your stand with enough time to engage in conversation. A great way of attracting visitors to your exhibition stand is to run a competition. People love to win, and if they go away with a quality prize, even better. The important thing with competitions is to make them work for you and your business. You don’t want visitors just dropping their business card into a pot to win a prize and not acknowledging your stand. It is important to have something that will engage them long enough for you to start a conversation and get them interested in your business, making your prize a worthwhile investment. The most successful competitions are ones where the visitor has to do something in order to enter or win. This means they should have to stay on your stand long enough for you to strike up a conversation with them regarding your business products or services. Instead of just dropping their business cards in a bowl, think of ways where visitors would be engaged to stay. This could vary from estimation games to challenges such as the Batak. Anything where passers-by have to actually participate is a great way to engage with potential clients. If your competition is too difficult or complicated, visitors will not be persuaded to enter, no matter how amazing the prize is. To avoid this, make your competition easy, fun and not too time-consuming. A good example of this is to run a competition where you have to answer a question or find something located on your stand! The idea is to engage them, but not for too long that you can’t speak to other visitors. A unique competition will get exhibition attendees talking about your stand- and in turn, other exhibitors and attendees will want to visit you. Word of mouth is one of the oldest and most precious marketing tools. Even if their main reason for visiting your stand is the competition, once they are there you still have the opportunity to pitch your business and your products to them. Most people have a competitive streak in them – introducing an element of competition to the contest can help to create a buzz and should result in more visitors wanting to enter. For example, run an interactive competition where the highest score or fastest time wins. If you are exhibiting for more than one day, you need to decide if you are going to run your competition throughout the whole event. Quick tip – if you run your competition for the whole event, you are more likely to have higher interaction. If your competition is over on the first day, the footfall to your stand may decrease for the remaining days. A good quality prize is vital. You need to think about your prize carefully and try to make it relevant to your industry. The quality of your prize will reflect the quality of your business and brand. Think about your target audience when picking a prize. If they are young, then they may be interested in something technological such as a GoPro or a hoverboard. A suitable prize to those who are attending the event is essential in order to increase your footfall. Interaction via social media will boost your presence at a show. Tweet and talk about your stand, advise visitors where you are, who you are and what you’re all about. Promote your competition via social media – this will encourage visitors that may have missed your stand to double back and connect with you. When it comes to announcing your winner, there are two great advantages to doing it via your social media pages. It will encourage visitors to find your pages and follow your business. You then have the opportunity to keep pitching your business to them via these channels whilst creating a large amount of interaction. This is the reason for exhibiting in the first place; you want to generate new business opportunities and leads to make a return on your investment in that exhibition. Ensure someone follows up every lead with a phone call or email the next day. Leaving it too late to follow up will result in the lead going cold. Competitions can work really well to attract visitors to your exhibition stand, but as with everything, they need careful consideration as to what will work best for your business and the exhibition you are attending. 1. How many sweets are in the jar? This is a classic competition and it is sure to create some friendly competition amongst the exhibition attendees. This is also a classic competition and it is one that people will really concentrate on. Instead of selling raffle tickets you hand them out and request visitors to revisit your stand at a specific time to draw the raffle. Adding a great interactive element increases the excitement towards your exhibition stand. It creates an engaging incentive, especially for younger target audiences. This can be something you have deliberately hidden within your artwork or stand. A popular favourite with a younger audience is a ‘Where’s Wally’ themed competition. You could do a timed competition where it is the fastest person to find Wally that wins the prize. This will create a great buzz amongst the visitors. If you want to incorporate technology into your competition, you could do so by using a virtual reality headset. You are then able to stand out against other exhibitions with something that is fresh and exciting. You could film where’s wally onto your VR headset to make it more intriguing. We held a Virtual Reality Challenge this year at the Careers Event which proved to be very successful. 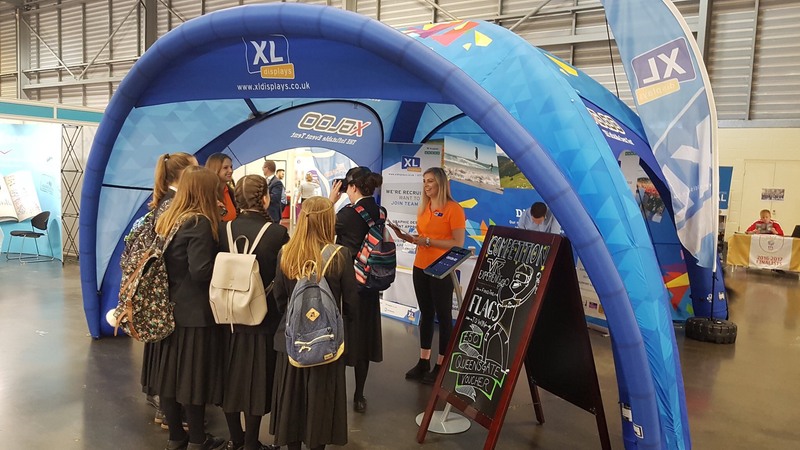 At the Skills Service Careers Fair, we ran a competition where entrants had to look around the XGLOO Inflatable Events Tent using the VR headset and remember all the flags relating to the World Cup. After the 30 second time limit, they would then have to tick which countries from a list was shown in the VR clip. The winner of the competition was the individual who spotted the highest number of correct flags. The winner would receive a £50 Queensgate voucher. To increase engagement on social media, we got visitors to follow and like our social media as we choose to release the winners name through Facebook, Instagram and Twitter. This competition was extremely successful, and we gained a great presence at the show. Having this need for interaction meant we were able to spend quality time with potential customers visiting our stand. It also had the much-needed element of fun and created a great talking point for the show. Browse our exhibition stand directory to find events and trade shows near you.